These rich and fudgy Peppermint Patty Brownie Bites need to make an appearance on your holiday dessert table! Chocolate and mint just scream Christmas to me! And since fudgy brownies are my favorite dessert, these Peppermint Patty Brownies are perfect little bites of heaven! You don’t even need a mixer for this easy recipe! 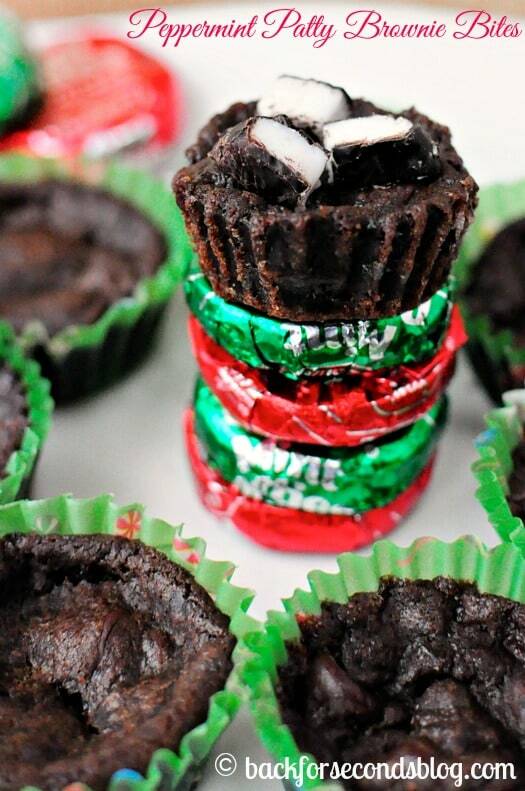 Peppermint Patty Brownie Bites! Wowzers want! oh wow – these all look so amazing! Now I want one of each! I love peppermint–these look dangerously good! I love peppermint patties and these brownie bites look incredible! I would love these brownie bites since peppermint patties are one of my favorites. Here is the recipe for the Christmas Bark http://backforseconds.com/easy-christmas-bark-recipe/ Enjoy!